I’ve always considered that I do more ‘cooking’ that ‘baking’ although if you read the blog I probably do more baking than I think I do. Recently I decided that I might want to try baking our own bread rather than buying it from the store. Not quite sure where to start exactly I decided that I’d go with this recipe first. It is out of the Better Homes and Gardens New Cookbook Bridal Edition. 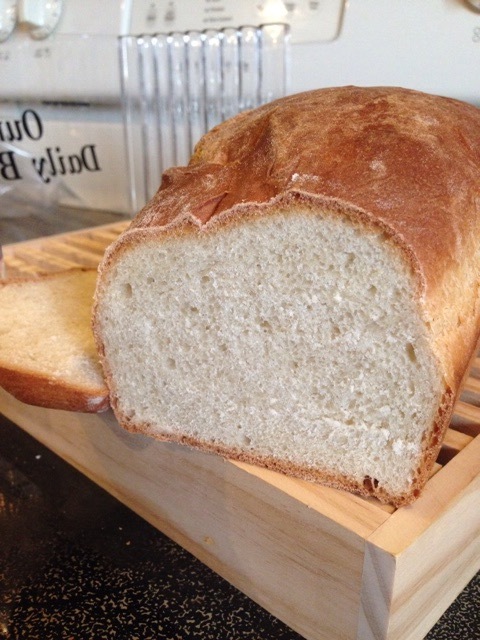 It is a basic white bread recipe, nothing fancy. I think it turned out pretty well. It tastes good and while it is a little dense it isn’t too hard. The loaves did turn out to be smaller than I would have liked them to be. Definitely smaller than one you would buy at the store. This recipe didn’t give the option to use one pan instead of splitting it in half but I’m sure there is a recipe out there to do that with. Not too bad for the first go. In a large mixing bowl combine 2 1/2 cups of the flour with the yeast. Set aside. In a medium saucepan, heat the milk, sugar, butter and salt until just wam and the butter almost melts (I left it in until most of the bitter was melted but a small piece hadn’t). Add milk mixture to the flour mixture. Best with an electric mixer on low to medium speed for 30 seconds, scraping the sides constantly (I have a paddle attachment that has a scraper so I didn’t do any scraping). Beat on high speed for 3 minutes (careful, it will splash). Using a wooden spoon,native in as much of the remaining flour as you can. I was able to get it all in, especially when kneading it. Turn dough out onto a lightly floured surface. Knead in enough of the remaining flour to make a moderately stiff dough that is smooth and elastic (6 to 8 minutes total). Shape dough into a ball. Place in a lightly greased bowl, turning once to coat the top. Cover; let rise in a warm place until double in size (45 to 60 minutes). I went with 60. Punch dough down. Turn out onto a lightly floured surface; divide in half. Cover; let rest 10 minutes. Meanwhile, lightly grease two 8x4x2 inch loaf pans. Shape dough into loaves by patting or rolling. (I chose patting). To shape by patting, gently pat and pinch, tucking edges underneath. To shape by rolling, on a lightly floured surface roll each dough half into a 12×8 inch rectangle. Roll up each rectangle, starting from the short side. Seal seam with your fingers. Place loaves in prepared pans. Cover and let rise in a warm place until nearly drunk in size (30 to 40 minutes). Bake in a 375 degree oven for 40 minutes or until bread sounds hollow when lightly tapped. If necessary, cover loosely with foil the last 10 minutes to prevent over browning. Immediately remove bread from pans. Cool on wire racks. This entry was posted in Bread and tagged basic bread, basic white bread, bread, white bread. Bookmark the permalink.